Thank you to our Parish Choir for their continued service to St. Edward’s. Thank you to our Parish Instrumentalists who add their skills and talents to our services as their schedules permit. They too put in many, many volunteer hours each year. What beauty they add to our musical lives! Thanks to the generosity of many parishioners, we enjoyed guest musicians throughout the year, and thanks to Matt Bonaker, who stepped up to restart St. Ed’s handbell program. Our facilities continue to be used for performances by various outside groups for recitals, lessons, and performances. It is the hope that lessons here at the church will nurture a new generation of musicians at St. Edward’s. We hope to continue to expand that program in the future to include piano, voice and guitar lessons. Thank you to St. Edward’s for making it possible for me to attend the Sewanee Church Music Conference at The University of the South. This past summer was my tenth year attending this gathering of Episcopal musicians, and it plays a vital role in my personal spiritual formation as well as my music & liturgy formation. 2019 Parish Choir: Lee Ann Sipe, Pat Bratton, Mikki Dillon, Comfort Manobah, Gary Daniels, Betty Kristoff, Joy Sibley, Hugh O’Neil, Navar Steed, Frances Hart, Matt Bonaker, Mary Lu Rogers, Hillary Saunders, Marvelle Martin, Stephanie Epps, Lorenzo Clarke, John Talipsky Sr., Sanya Simmons, Jay Franks, John Ruch, Wendell Dillon, Jeannette Best-Nunez, Vanya Davis, Janet Perkins, Charles Rogers, Denise Robinson, Charlene Walsh. Thinking of joining the choir? Are you an instrumentalist? Would you like to play with us on Sundays? See Carla on Sunday, or send her an email – she can find a way to help you put your gifts and talents to good use for the glory of God! Bless O Lord, us your servants who minister in your temple. Grant that what we sing with our lips we may believe in our hearts, and what we believe in our hearts we may show forth in our lives, through Jesus Christ our Lord. Amen. We welcome new choristers and instrumentalists to our music program at St. Edward’s! Please see our music site at saintedmusic.weebly.com to get more information on how to join our choir or our instrumental groups. If you have a musical gift, let us help you find ways you can use your talents to the glory of God! You will also find a form on the music site where you can REQUEST HYMNS & SONGS. The music program at St. Edward’s is made up of roughly 28 intrepid choir members, ranging in age and experience level: some are professional singers, organists, conductors, and performers; some are just making their foray into the world of choral singing. It all works! We pull in musicians from our ‘tween and teen population from time to time. We gather regularly outside our rehearsal schedule, and every week we end our rehearsal time by sharing our concerns and thanksgivings with one another and in prayer. 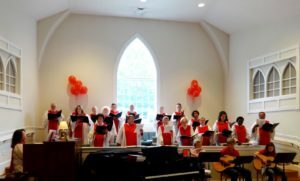 Our music program is based in the Anglican tradition, but you’ll find us using resources from the various approved Episcopal Hymnals and supplemental volumes, Gregorian chant, world music sources, classical music, songs from Catholic missals, the Lutheran hymnal, and standards from the Protestant tradition. Though we use primarily organ, piano and flute in a typical service, we also have a cadre of wonderful instrumentalists in the house, and we regularly put them to good use (especially our gifted guitarist when he’s in town)! Our music program is lively and varied and diverse, just like our congregation. There are extra rehearsals called during the year as needed, to prepare for special services and events. We welcome new choristers and instrumentalists. Please see our choir site at saintedmusic.weebly.com to get more information on how to join. If you have a musical gift, let us find ways you can use your talents to the glory of God! Carla Strott is the music director/organist/pianist/coffee-drinker/sneaky-thermostat-resetter at St. Edward’s.